The global solar tracker market is valued at an estimated $7.25 billion and experts anticipate more than 18% growth in the next seven years. Extended awareness of renewable energy resources and falling solar prices have made it possible for further developments in tracking technology. Single axis solar trackers, which rotate on an axis and oscillate in horizontal, vertical, tilted or polar aligned direction. Dual axis solar trackers, which move both horizontally and vertically, so they’re always facing the sun and maximizing solar energy collection. Solar trackers are ideal for maximizing land usage because they use the same amount of space as a fixed system. Additionally, new developments in technology have made these trackers more reliable by greatly reducing maintenance. Solar power and schools work well together because the sun is out the entire time schools are in session. Today, over 5,000 schools across the U.S are investing in solar installations and saving money on electric bills. There are even departments within the federal government that offer solar grants for schools, rural farms, low-income communities and tribal areas. Major corporations also realize how cost-effective the 20-year lifespan of a solar panel can be. Collectively, the top 25 U.S. corporate solar users, which include Apple, Target, Wal-Mart and more, installed more than 1 gigawatt (GW) of solar capacity, which is enough to power 193,000 homes. Not only is this cost-effective, it’s also eco-friendly. The Solar Energy Industries Association claims the number of solar power systems installed by corporations and business in the United States is enough to offset 1.1 million metric tons of carbon dioxide each year. 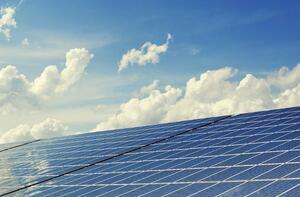 As prices fall, more facilities utilize solar energy, which results in major market opportunities for manufacturers. From portable lanterns to 100+ watt residential home systems, off-grid solar products have been in high demand. Manufacturers have sold over 130 million off-grid solar devices since 2010 and generated an estimated $1 billion in revenue in 2016. Off-grid solar power systems are typically used to power direct current (DC) appliances in boats, cabins and RV’s. DC is less expensive than alternating current (AC) solar power because it doesn’t require an inverter. Are you a manufacturer in the solar industry? Download our Solar Profile Engineering Guide to learn how you can cut design times, easily compare section properties and reduce material content during your manufacturing process.